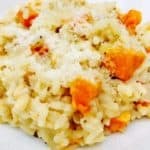 In Italy, risotto is considered a real kid friendly dish and this one is brilliant as it requires minimal effort and you can pop out whilst it's cooking in the oven! The butternut squash has a great flavour when roasted, but if you are short on time, you can simmer it until tender instead. Can be stored in the fridge for 2 - 3 days. Replace the butter & parmesan for vegan & dairy free option. Place the butternut squash in a roasting tray, drizzle with olive oil and sprinkle the thyme leaves over the top. Place in the oven for 30 minutes. Add the butter to an oven proof casserole dish and over a medium heat fry the onion for 5 minutes until soft. Add the white wine and stir until it is all absorbed. Cover with a tight fitting lid or several layer of tin foil and cook in the oven for around 20 minutes until the liquid is all absorbed and the rice is tender. Remove the risotto and butternut squash from the oven and stir in the parmesan cheese and walnut pieces and leave to stand for 5 minutes, which allows it to go all creamy. Serve with a little extra parmesan sprinkled over the top. In a hurry or not all eating together? Risotto should really be eaten straight away. As this doesn't require much attention during cooking, I would recommend getting everything ready, frying the onions and cooking the rest when ready. You can however, re-heat a portion. Add the squash to the pan after the wine, then add the stock slowly, stirring all the time.